February 4, 2019 – – Lorain County Community College Women’s Basketball team pulled off a huge victory over local rival, Cuyahoga Community College with a 57-54 win that came down to the final seconds and a missed 3-pointer at the buzzer by Tri-C. The Commodores were just 2-10 all-time against the Triceratops coming into tonight’s game, a team they haven’t beaten since 2008. The Triceratops lived up to their name, but instead of three horns it seemed like they each had three hands when crashing the boards – grabbing 61 rebounds to 31 for the Commodores. Lorain got out to an early 11-6 lead in the first, but Tri-C closed the gap with several second chance opportunities. The second quarter started with a quick three by LCCC to go up 19-12, when Tri-C again battled back to keep it close at the half. Tri-C made a run in the third period to knot the score and the teams traded buckets the rest of the night, in a game that featured 10 lead changes up until the final moments. Marquita Thompson (Cleveland/John Marshall) had an outstanding shooting night for the Commodores, connecting on 7-10 from the field and a perfect 4-4 from long-distance, to finish with 18 points. Tyeisha Sain (Bedford) led LCCC with 10 boards, while just missing the double-double with 9 points. 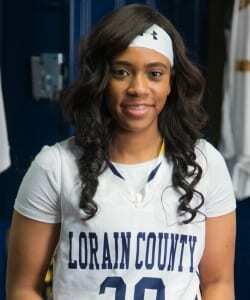 Ronnette Rahmon-Sumlin (North Olmsted) was the only other LCCC player in double-digits, adding 10 points. LCCC’s 10th victory of the season, matches the best win total since the 2013-14 season and their best since joining the competitive Ohio Community College Athletic Conference in the 2014-15 season. Lorain now stands at 10-13 overall and 4-6 in OCCAC play. Tri-C falls to 9-11 and 3-5 in the conference. LCCC returns home at 1 p.m., this Saturday, February 9, 2019 against OCCAC D-III rival Clark State.